The Balboa Hydromassage Pumps provide excellent hydraulic performance in a compact andextremely quiet design. 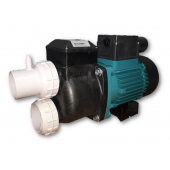 Designed to circulate hot water in (whirlpool) spa baths, these pumps incorporate a special internal design to ensure the pump self drains eliminating the build up of unhygenic/stale water. Pump models 2371, 2381, 2391 and 2401 are manufactured with integrated heating element and control devices to maintain water temperature and compensate for the natural cooling of the spa bath. The heater function is designed to only operate with the hydromassage pump at normal operating pressure. The combined operation of the heater and pump is controlled from the bath by a single air button. The heating function is monitored by a pre-set thermostat to maintain water temperature to amaximum 40°C, interlocked to a secondary upperlimit cut out for added protection to maintain a safe water temperature.